Featured Image: Reproduced from Niwa, M., Hirayama, T., Oomoto, I., Ohtan Wang, D., Nagasawa, H. ACS Chemical Biology 2018 3 (5), 1853-1861. Copyright 2018 American Chemical Society. This is an unofficial adaptation of an article that appeared in an ACS publication. 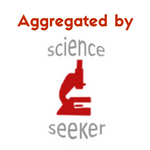 ACS has not endorsed the content of this adaptation or the context of its use. Iron is a bit of a complicated character in biology. It is necessary for processes including oxygen transport via red blood cells, DNA synthesis, and some enzymatic reactions, such as when enzymes in our bodies called P450s metabolize drugs so they can be expelled as waste. However, when iron is improperly regulated, it can also lead to the accumulation of free radicals, which are extremely unstable molecules that react quickly with other molecules, wreaking havoc throughout the cell in a process called oxidative stress. In all of these cases, iron’s specific role relies on its ability to readily change redox states, either accepting or giving up an electron. (Remember the mnemonic: Oxidation Is Loss of an electron, Reduction Is Gain.) Although other redox states of iron are possible, this study focuses on Fe(II), which has a 2+ charge, and Fe(III) with a 3+ charge. The redox state of an iron ion controls what kinds of reactions it can participate in, and what kinds of proteins—such as receptors and transporters—a free iron can bind. The current study has sought to develop a method to determine the redox state of iron when it enters into a human cell. When we foods like steak or broccoli, the iron from the food circulates in the blood to arrive at all the cells in the body. However, because iron has such potential for destruction, the cell has to carefully regulate its uptake into the cell. There are two known pathways for iron uptake. One is through divalent metal transporter 1 (DMT1) which uses the energy from ATP to actively transport iron into the cell. The other is through endocytosis, where Fe(III) binds the membrane protein transferrin (in what’s called the Tf-Fe(III) complex, or “holoTf”), which in turn binds the transferrin receptor TfR. This complex then binds proteins that cause endocytosis: the internalization of a piece of the cell membrane to form a vesicle membrane inside the cell. This vesicle, called an endosome, becomes very acidic, and this causes Tf to let go of its bound Fe(III). From here, DMT1 is known to transport the iron from the endosome out to the cytoplasm. Even though iron usually exists as Fe(III) outside the cell, in the cytoplasm, and when bound to Tf, it has been hypothesized that DMT1 will only transport Fe(II), although evidence for this redox specificity had not been observed previously. There are enzymes called “reductases” in membranes on the cell surface and in endosomes that are thought to make this conversion from Fe(III) to Fe(II) in order for DMT1 to transport the metal. To find support for this hypothesis, the authors of this article have created a molecular probe that sticks to the membrane and reacts specifically with Fe(II) to fluoresce. The probe they created is called “Mem-RhoNox” (nox meaning no light or no fluorescence, and Mem indicating its association with the membrane) which reacts with Fe(II) to become “Mem-Rhodamine” which fluoresces, producing light at 575nm. Mem-Rhodamine is the “deoxygenated” version of Mem-RhoNox, since the two are identical, except that Mem-Rhodamine has one less oxygen atom (highlighted in green). Both species interact with the cell membrane through hydrophobic chains (highlighted in red), and are prevented from going all the way through the membrane by a negatively charged portion (highlighted in blue). This probe is an improvement over previous probes for this study because most fluorescent molecules either are not specific for Fe(II) or are quenched (lose their fluorescent ability) in the presence of the metal. Also, the probe’s ability to stick to the membrane without going all the way through is necessary to probe only the iron that is ready for DMT1 transport. As can be seen in the images below, the researchers were able to see Mem-Rhodamine fluorescence at the cell membrane just 15 minutes after Fe(II) was added to the cells. Fluorescence could also be seen when Fe(III) was added, but it did not appear until after 30 minutes, which makes sense if reductases must first convert the Fe(III) to Fe(II) before reaction with Mem-RhoNox can occur. These experiments show that Mem-RhoNox can indeed bind the cell surface and react specifically with Fe(II). They also show that Fe(III) can be converted to Fe(II) at the cell surface. To see whether the same process is happening in the endosome, a similar experiment was performed where cells were treated with Tf-Fe(III) to induce endocytosis. Here, fluorescence was seen inside the cell, in a clustered “dot ” pattern which is known to be characteristic of fluorescence from within endosomes. 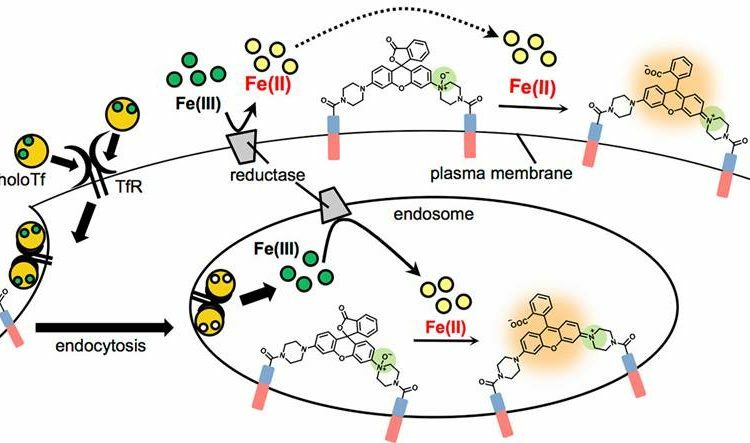 Since the iron was introduced bound to transferrin in the Fe(III) state, this experiment shows that Fe(III) was released from transferrin and converted to Fe(II) in the endosome. More information about additional experiments and control conditions can be found in the article itself, giving further insight into what might be taking place in the cell. After developing an Fe(II)-specific, membrane-associated fluorescent probe, the authors have demonstrated its utility by providing some evidence in support of a hypothesis that was long believed to be true but was difficult to test. Thanks to this probe, researchers will now have a new way to learn about iron in the cell: with Mem-Rhodamine lighting the way. Michelle is a PhD candidate in Chemical Biology at the University of Florida. In addition to science, she loves nature trails, painting and drawing, and her cat Mitten.